Few people know the many areas attorneys practice within. A single image tends to come to mind, whether it’s arguing a court case, negotiating a complex transaction, or sitting in an office buried under paperwork full of complicated legal jargon. A career in law wasn’t Alan Cardenas’ first choice until he found an aspect of law that intrigued him. After considering many different professions while working toward his undergraduate degree at Rutgers University, Cardenas finally decided upon law school after getting some advice from friends and professionals in the industry. Once at Rutgers Law School, Cardenas had some trouble deciding what aspect of law was for him. It wasn’t until he discovered corporate law in his second year of law school that he knew he had found his path. “I realized it was a terrific blend of business and the law, and I never looked back,” Cardenas says. When he entered his role at Siemens, a 170-year old global manufacturing, engineering, and technology company, Cardenas had plenty of opportunities to put his wide-ranging interests to good use. In the more than nine years he’s worked there, he’s led the legal side of everything from venture capital in the Americas to corporate communications, internal reorganizations, and corporate supply-chain management in the US. Cardenas is grateful for the wonderful legal minds he’s had the opportunity to work with and manage throughout his career. He’s gotten to work with talented attorneys who are capable of handling the many swift changes that are coming to the legal industry on a daily basis. “I think, for years, the legal industry thought it was so unique, or the skills of its practitioners so hard to replicate, that it would be immune from some of the disruptive technologies that were impacting other industries,” Cardenas says. On the contrary, a recent McKinsey study found that as much as 23 percent of an attorney’s job could be automated. “And that’s only considering the technology that exists today,” Cardenas says. In-house legal departments not only can benefit from some of the automation tools that are starting to revolutionize the industry, but also need to take advantage of them if they’re going to survive in today’s ever-changing world. Cardenas notes, for example, the rise of digital threats such as cyberattacks, which have resulted in software that aims to protect against such risks—and a subsequent rise in data-protection and data-security roles. For example, e-discovery tools have been extremely helpful in minimizing the large-scale, highly expensive document-review process that was the norm only about a decade ago. Cardenas thinks the administrative area of law will be particularly affected by advances in technology, at least to begin with. As the technology continues to develop, attorneys need to learn to use it to help them work smarter, rather than harder. 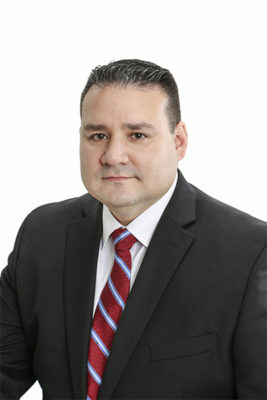 While Cardenas admits it’s perfectly natural, and even healthy, for attorneys to be skeptical of new technologies, he also says they need to remain open to the possibility of adopting new technological solutions that can help them do their jobs better. A question people frequently ask Cardenas is whether these new technologies for the legal industry are coming from the industry itself or from Silicon Valley. When seeking out new legal talent, Cardenas is always on the lookout for those who are just as excited as he is about the changes the industry is currently going through. That said, Cardenas does not want people who will talk up the benefits of new technology simply because it’s new. He needs critical thinkers who are able to analyze both the status quo and emerging technologies and take the best of both worlds and merge them together. While new technology can sometimes mitigate risks, other times it can increase risks, so Cardenas needs people who are able to tell the difference and act accordingly. “I look for people who are open to the technology revolution that is coming, and who are nimble enough to operate effectively within it,” Cardenas says. Patterson Belknap congratulates Alan Cardenas on this well-deserved recognition. We value our partnership with Siemens and admire the company for its commitment to innovation. Patterson Belknap Webb & Tyler LLP is a New York City-based law firm with more than 200 lawyers. For more information, please visit www.pbwt.com.